If you are interested to hear how I managed to lower my blood pressure without having to take pills, and how I improved my general fitness, please read my story below. Otherwise, just jump to the table below to pick an interesting aspect of my story. 1.1 Why is High Blood Pressure known as Silent Killer? 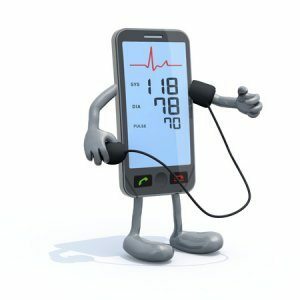 2.2 Does Exercise Lower Blood Pressure? 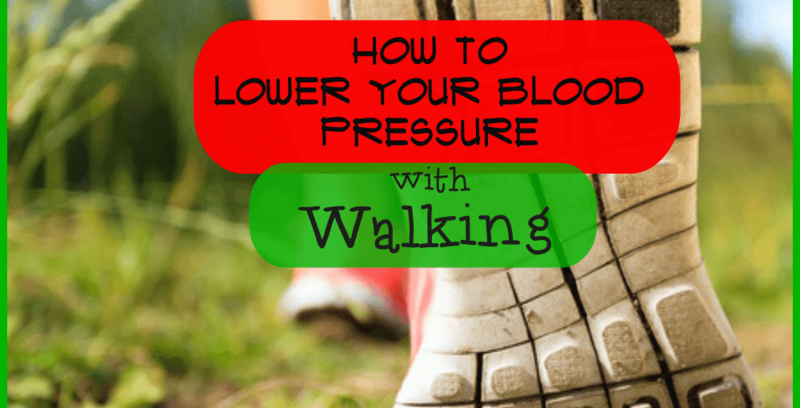 2.3 Can Exercise Lower Blood Pressure? 2.3.0.3 Is there Anything Else? 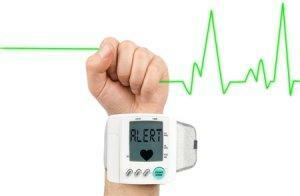 Why is High Blood Pressure known as Silent Killer? I had no idea my blood pressure had climbed a lot since my last checkup a year ago; I experienced no symptoms or signs. Actually, I felt pretty fit and well when I had my pressure taken within the context of a mini medical for my health insurance. I found out that my blood pressure was very high: 159/98 mmHg. A normal blood pressure, although it can change with exercise or posture, should be lower than 120/80 mmHg. If I didn’t want to take pills- and I didn’t- I needed to get a handle on this problem fast. I am not terribly overweight, and I felt reasonably fit throughout my life. I swam in competitions as a teenager but continued with sport only half-heartedly throughout my years at university. Finally, after years of postgraduate training and moving around, I settled in one place and took up a position locally. A colleague introduced me to the local health and racquets club, where I became a member, but I did not make full use of all the facilities for a long time. I began to take up tennis lessons as I had played tennis during my university years for fun. While my technique improved significantly and I started to play more, I noticed that my stamina in a singles game was not up to speed. My tennis coach suggested some personal training, which was great and helped me to move better. However, my aerobic fitness did not improve a lot. Apart from the personal training once a week for an hour, a tennis lesson and a bit of yoga, I didn’t do very much. I also noticed that I began to use the lift in the house more than the stairs, and felt a little out of puff if I had to climb more than two flights of stairs. Here I was on my path to sedentary life, becoming unfit, possibly needing pills to prevent a stroke, heart attack and maybe an operation. I needed a good plan to get myself out of a potentially dangerous health problem and back into solid physical fitness. I had tried yoga, meditation, breathing exercises, a Mediterranean diet, and herbs, but it did not help me to lower my blood pressure sufficiently. Looking back, I have to admit that all of the above methods are great supporting measures, but as far as I see it there is only one way to improve endurance and health, and that is regular aerobic exercise. I became a Vitality Health member through a buddy at my local fitness club. Vitality Health differs somewhat from other health insurers in that they not only protect you when you are ill. They encourage members to be healthy and through rewards keep them motivated. The more effort you put into your health, the more rewards you get to stay motivated. Until recently Vitality operated a system, whereby you could get the maximum daily activity points just for turning up at the gym; you didn’t need to show that you actually did some work. These points together with credits for health checkups and eating healthily would then determine if you get a Bronze-, Silver- Gold or Platinum status for a year. I found it relatively easy to achieve the platinum status within one year of joining and to make good use of all the great benefits, which come with it. However, the reward system changed, meaning that for simply swiping into the club I would now receive 50% of my maximum daily points. I had to show that I am “active” using a fitness tracker. Mind you I had occasionally wondered how easy it is to get all the points for the week by swiping in and sitting in the cafeteria with a friend over a medium latte and a muffin, or a burger and beer, only to leave without having exercised at all. Admittedly, even I with my regular gym attendance have been guilty of pretending a few times. One of my sports buddies, who encouraged me to join Vitality, started wearing a Garmin fitness band. He told me that the watch had totally changed his life. To see what makes a wearable tracking device so fantastic, I decided to buy the Garmin Vivosmart HR. My primary motivation at that point was to purchase a fitness tracker only to keep up with my platinum reward status. Once I had my Vivosmart HR, I installed the corresponding app on my phone and hooked it up to my Vitality account. The system promised me that every time I complete an activity at a particular intensity level, it would credit the points. I found out that not only does the technology keep its word, it also seems to be set up to reward and favor a trackable activity over a simple gym visit, that is very clever indeed. 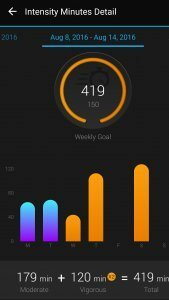 To get my daily maximum points I needed to track my activities, such as monitoring my steps or working out at a particular percentage of my maximum heart rate. However, my weekly exercise routine included mainly Hatha yoga and Pilates classes, which were great as recovery sessions, but would not get my heart rate going. The problem was, that I lacked cardio to improve my aerobic fitness and my ability to sustain a high-intensity effort for longer. Most importantly, however, I have learned that there are plenty of health benefits of regular aerobic exercises. Just to name a few: they lower blood pressure and cholesterol, keep the blood sugar in check plus- if done in the right way- they will help to get a few pounds off of your midriff. At my local club they offer cardio tennis, but looking at my contemporaries when they came out of the hour-long session- and some of them were near exhaustion- I sensed that I was not up to that degree of aerobic exercise and didn’t even try it once. I wasn’t fit at all but thought I was. How on earth would I be able to accommodate seven to eight miles per day into my busy lifestyle? Also, why 12,500 steps and not 12,000 or 11,500 steps? But I figured if an insurance company rewards certain activities with the highest number of points per day, they know why. More on that below. Over the following three weeks I started testing my new Garmin Vivosmart HR, and let me tell you it was a lot of fun. I covered 26 miles, on average 6.4 miles per week, and I burnt 3518 calories, but the best part of it all was that I saw my blood pressure climbing down. I began to like my walks and missed them on days when I could not exercise. ” You usually move more on Mondays than you have today. It’s not too late to get back on track. Take a short walk around the block to clear your head and make it a great Monday”. My word, this device started spying on my habits. To start testing my new fitness band, I had to decide where and when I would use it and how much time I had available. We are living on the outskirts of a city, providing us with plenty of different walks, run or cycling opportunities; it seemed to be just the right territory to discover the capabilities of my Garmin watch. First, I tried to work out how long it would take me to get 12500 steps together. My research told me that health experts consider this activity level as “Highly Active.” I realized that 12500 steps would take me more than an hour, perhaps one hour and a bit. On a busy day at work, even if I took all the stairs, parked further away, etc., I would only manage around 5500 steps. I also discovered that 5000-7499 steps would be considered “Low Active.” If I only took up to 5000 steps a day, my level of activity was “Sedentary”- oh my word. How would a busy person, who is working full time, be able to fit in more than 7500 steps into their daily schedule? It feels the more-than-7000-step-thing is more for people whose primary activity is walking. I would agree with Steve Farrel, the science officer in the division of education at the Cooper Institute, a nonprofit preventive medicine institute in Dallas, who was quoted in the Los Angeles Times. What about folks who love to swim, bike, dance or trampoline? That’s not a problem. Maybe there was another way, such as achieving the same activity goal in less time. I discovered that I could earn all the points for a particular level of walking, running and cycling, or burning a certain amount of calories. However, what worked best for me, was monitoring my heart rate during a 30-minute power walk. The key was to exercise either at 60% of my max age-related heart rate for 60 minutes or to workout at 70% for 30 minutes- perfect! I just needed to set my Garmin watch to keep me in the target zone. I bought an Omron blood pressure monitor on Amazon and began to take pressure readings twice daily. By the way, I got an upper arm blood pressure monitor and not a wrist pressure monitor for two reasons. First, my doctor would always use an upper arm monitor in her practice. Second , I had used a wrist monitor previously and when I compared the readings with my new machine, the monitor at the wrist would almost always read lower. As the weather was great, I chose to go for power walks. I set my Vivosmart HR at my desired workout level and went for the option to walk at 70% of my age- related maximum heart rate for at least 30 minutes. 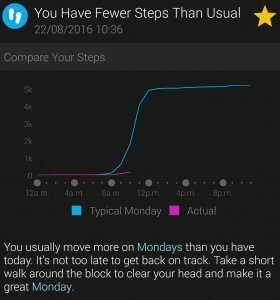 My Vivosmart HR would alert me if my pulse were too low or too high so that I could tailor my pace and level of activity accordingly. I noticed that my blood pressure readings began to drop to very acceptable levels, and after three weeks of training, I was sitting pretty at or even below 120/80 mmHg. The best thing was, I have avoided pills so far. I am now hooked on brisk walking, and I get rewarded for it. But even if I didn’t get reward points, simply being able to lower my blood pressure naturally by exercising is good enough for me. I encourage you to try it for yourself and see the health benefits you get from regular aerobic exercises. Just look around your neighborhood and you might discover walking, running or biking opportunities you’ve never considered before. We’ve spotted a huge parkland near where we live, a place where we previously just drove past. But before you start any new exercise program, go and see your physician first. Be particularly careful if you have not exercised for a while, you are over 40 years, you have a health condition or any health concerns. Can Exercise Lower Blood Pressure? In all honesty, I am so pleased that my health insurers point system has changed. I would not have discovered how unfit I was, I wouldn’t have reflected on my exercise habits and changed them. What I needed was a more challenging training program, which made me break a sweat on a regular basis. Currently, I go for a brisk walk on four days of the week, but I would still move on the remaining days. I avoid using the lift even if I carry shopping bags. My blood pressure is normal, I feel less out of puff and I am fitter. In case you have decided to move more, be warned: this type of exercise can become addictive….. 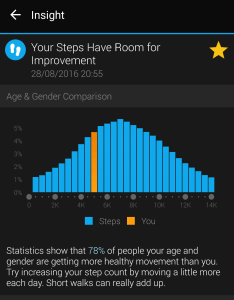 When I got my Garmin Vivosmart HR, I did some research on current recommendations for fitness- and health improvement. I have learned that we should do at least 30 minutes of moderate-intensity aerobic activity, such as brisk walking, at least five times a week for a total of 150 minutes. OR at least 25 minutes of vigorous aerobic activity, such as running or cycling, at least three days a week for a total of 75 minutes. If you prefer, you could do a combination of moderate and vigorous- intensity aerobic activity; your Garmin fitness band will monitor your effort and display your progress. In addition, you should include moderate-to-high-intensity muscle-strengthening exercises on at least two days per week for extra fitness and health benefits. And don’t forget to add some flexibility training as well. For lowering blood pressure and cholesterol, they recommend training for 40 minutes at a moderate-to-vigorous-intensity level three to four times per week. There you have it, food for thought. It is best to start small, also, if you cannot make it to your planned activity goal- something is always better than nothing. Before you start a new exercise routine, don’t forget to see your doctor first. Health organizations recommend that you do at least 10 minutes at the time to get any health benefits and for the fitness tracker to count it. Any vigorous activity is only counted when you are tracking your heart rate together with your activity. It is just amazing what a combination of a change in policy and incentives, a fitness tracker, curiosity and willpower can achieve. I have a new fitness routine, a better blood pressure, and a healthy aging strategy. I hope you enjoyed reading my story and if you have any questions or comments, please use the box below and let me know. Watch out for part 2 on how to set the Garmin Vivosmart HR for fitness tracking.